Will Silver Prices Rise in 2016? Subject: Will Silver Prices Rise in 2016? Today silver is trading around $17 an ounce. It's up for the year, but it hasn't been a straight line to this level. So far in May, the price of silver has risen about 4.3%. That compares to the S&P 500 Index that's up about 1% this month. Silver prices tumbled at the end of April. The decline on April 27 was likely caused by the Federal Open Market Committee (FOMC) meeting, which, although it indicated no change to interest rates in the near term, did leave open the possibility that they might be hiked later in the year. The FOMC's next meeting is June 14-15. The Fed was more positive on the economy than it has been in the past. Precious metals such as silver trade inversely with interest rates, as rising rates make dollar-denominated commodities less attractive. Thus, the market could be factoring in a future hike, and that's the reason why silver prices fell then. Overall, though, silver gained 15% in the month of April. And it's off to a great start in May. So what's ahead for silver, and what should investors watch for clues to where silver is headed? First, to understand where silver is headed, let's look a little more at what it's done this year. The dramatic run-up in silver prices in 2016 so far this year is the other reason why silver prices pulled back. Silver prices in 2016 have risen more than 20%, a strong and rapid rise that at some points has outpaced that of gold, when it's usually the yellow metal that outpaces the white. It's an even stronger climb from the long bear market in the price of silver that existed from 2010 to 2015. The rapid rise in silver in 2016 means that some short-term pullbacks in the price are likely. Money Morning Resource Investing Specialist Peter Krauth observed that commercial traders took close to four-year extreme short positions in silver in April, which was placing a drag on silver in the near term. Silver prices falling indicates how volatile the price of silver can be. It is affected by monetary policy, investor sentiment, and trader behavior. That's why investors can't get too caught up in the short-term silver price moves – unless you are playing the metal like a trader. The primary reason is the gold/silver ratio – the amount of silver ounces that it would take to purchase one ounce of gold. The gold/silver ratio has historically been at an average of 47 to 55. During March 2016, it reached a multiyear extreme at 83. Krauth's forecast is based on the gold/silver ratio returning to its historical average of from 47 to 55. Given recent gold prices, a 55 ratio would equal a $22 silver price, which is what he expects over the medium to long term. One reason silver prices will rise is solar power industry growth. Because of its conductivity, silver is used in the photovoltaic (PV) cells of solar panels. In fact, nearly two-thirds of an ounce of the white metal are used in each panel. Solar panels use 11% of the total silver mined every year. Worldwide demand for solar panels is a strong growth market and expected to increase 12% this year. That translates into strong demand for silver. The interest rate picture is also bullish for silver. The Fed has indicated it is unlikely to raise rates in the first half of the year. In a rising interest rate environment, the dollar's value rises and results in more expensive dollar-dominated commodities. An environment like that can decrease demand and thus drive silver prices down. The current environment is the opposite. That's good news for the price of silver. And the long-term outlook for the U.S. dollar isn't strong. While it's one of the stronger currencies among its global counterparts, it's not as strong as it used to be. And Krauth believes the Fed is underestimating inflation risk. The Fed will likely weaken the dollar with policy changes… but that's all good for silver prices rising. Investors can keep an eye on this dollar-silver relationship through the U.S. Dollar Index. It has already gone to 92, down from 98 at the start of 2016. Look for it to decline more. That kind of move will push some investors into safe-haven investments – and silver will benefit from that. 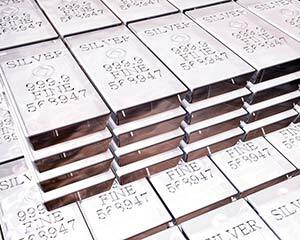 Given Krauth's long-term forecast, silver price pullbacks in the short term could mean good opportunities in silver stocks. Sprott Physical Silver Trust ETV (NYSE Arca: PSLV) has the convenience of trading on the NYSE but is backed up by silver bullion in Canada. The bullion is housed at a third-party location and is regularly inspected and audited. ProShares Ultra Silver ETF (NYSE Arca: AGQ), a leveraged exchange-traded fund (ETF), trades in futures contracts rather than in the white metal itself. The goal is leverage of the spot price of silver. Learn more about precious metals investing. Download our report: The Essential Guide to Buying Gold & Silver. You'll find out the best ways to include silver and gold in your portfolio, things to consider before buying physical gold and silver, dealers to review when buying, and how to expose your portfolio to metals without buying the physical coins and bars. Follow  Money Morning on Facebook and Twitter.